First of all, let me thank you all for keeping up to date with us and the situation with little Anabel. We appreciate all the thoughtful notes, emails, calls, texts and visits. For those that missed it, here’s the post I wrote about her Strawberry hemangioma. 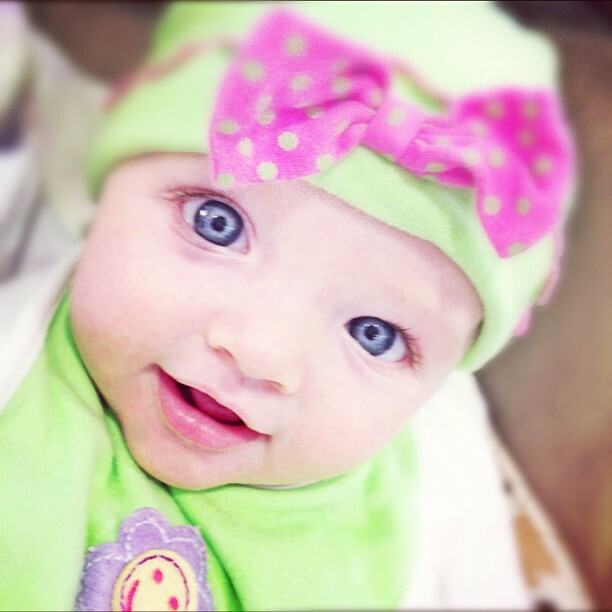 This is a type of benign infant tumor, and basically, hers was growing fast around her eye and was starting to threaten her vision. Doctors recommended we start treatment. 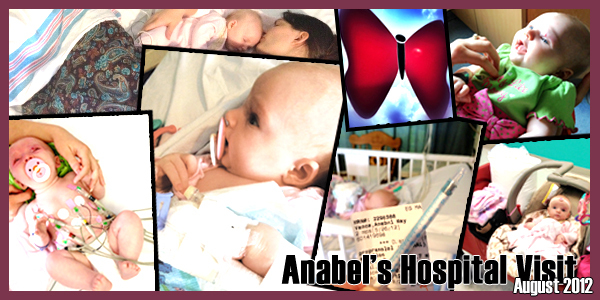 Here are a few pictures from our stay at Egleston’s Children’s Hospital in Atlanta for Anabel’s hemangioma treatment. Tuesday we went to see yet another specialist in Atlanta, this one a pediatric dermatologist. She recommended, as others had, that we begin treatment immediately with a medication called Propranolol. What’s crazy is that this type of treatment is so new for infantile tumors like Anabel’s, that if it had been our other daughter Amira just 2 years ago they would have gone a whole different route. Yet, nearly all studies and patients have shown amazing results. We spent two nights at Children’s Healthcare of Atlanta’s Egleston hospital in Atlanta as they began the medication. They performed an EKG to test Anabel’s heart before starting, then gave her 3 treatments a day. They monitored her blood pressure, heart rate, oxygen levels, and pulse as well as pricked her finger to check blood sugar after each treatment. The whole reason being in the hospital was to make sure none of these levels were to go down (since Propranolol is actually a heart medication, after all). We were told that if it were to make a difference in her tumor, we’d be likely to see a change before leaving the hospital. And sure enough, a change can be seen! We’ll be on this treatment for about a year, at which time the doctors hope for a full recovery. Thank you for your prayers. I know we serve a great God. He takes care of us, and does all things for our good and His glory. I have to be honest, we really enjoyed sleeping in our own bed again last night. But alas, we can’t stay put long… We’re about to leave in a few hours to drive all night to Ohio where we have a few meetings there & in Alabama before coming home. Pray that God continues to protect and provide as we serve Him and head toward Colombia as missionaries. About a week after our beautiful baby Anabel was born, we noticed a small dot on her left hand. Shortly afterwards, another, smaller dot appeared above her left eye. Both of these began to grow at a fairly rapid pace. We asked her doctor about these and we were told not to worry. These “dots” are known as Strawberry Hemangiomas. We were told that though the markings will worsen before improving, they disappear without treatment on nearly all children that have them after around 5-10 years. These hemangiomas, we found, are the most common of tumors in infants. They are benign and, as the doctor said, usually resolve themselves. 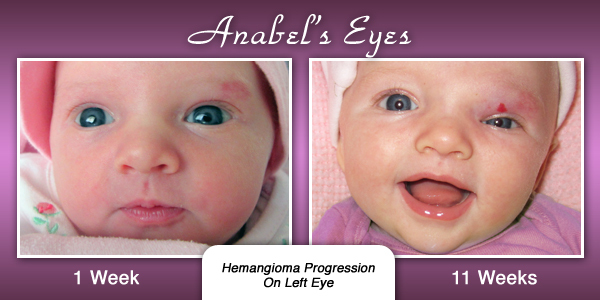 But, what the doctors did become concerned about, particularly at Anabel’s 2 month checkup, is that the tumor above her left eye has grown so much it has hindered her from opening her eye all the way. We were sent to an eye-specialist in Atlanta, who just followed up on her today. Since the growth is weighing on her eye and is swelling (mostly under the skin), it could cause her to lose vision in that eye. She may have to have corrective eyewear soon in life, but we will start treatment this week to try to reduce or remove the hemangioma. This should save her eye. Treatment used to consist of injecting steroids directly into the affected area or laser surgery. Amazingly, there has been a new development with treatment that was found accidentally. The blood-pressure medication Propranolol was found to be extremely effective when given to infants early on in the development of the hemangioma tumor. Anabel will have to be monitored (since the medication can slow down the heart), may spend 48 hours in the hospital, and she will need to be on this for a year before they wean her off of it. We pray that this treatment will work, but more than anything, we pray that God will be supremely glorified through whatever happens. Thank you for your prayers. We know that the Lord is good.